Designed to protect hands from a wide range of chemicals, oils, acids, and mechanical hazards, the Ansell Scorpio 09-922 Neoprene Anatomical Gauntlets are ideal for providing hand protection during a multitude of tasks. 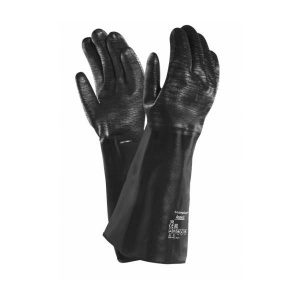 They feature a special construction to permit intermittent handling in a broad temperature range, while the anatomical glove shape contours to the hand for improved dexterity and reduced hand fatigue. The product code for the gauntlet gloves is: 09-922. When working in environments where harsh chemicals are present, it is paramount to ensure that the hands are sufficiently protected. The Scorpio 09-922 Nitrile Gauntlets protect the hands and wrists from a range of oils, acids, caustics, alcohols, and many solvents. They also provide good resistance to all mechanical hazards for improved safety in the workplace. While many gloves and gauntlets provide chemical protection, some may perform better than others outside of certain temperature ranges. With special Hi-Lo insulation, the 09-922 gauntlets permit intermittent handling in hot liquids up to 180°C and handling in cold temperatures down to -25°C. The table below showcases the test results of the Ansell Scorpio 09-922 gauntlets according to EN 388 Mechanical Risk specifications.